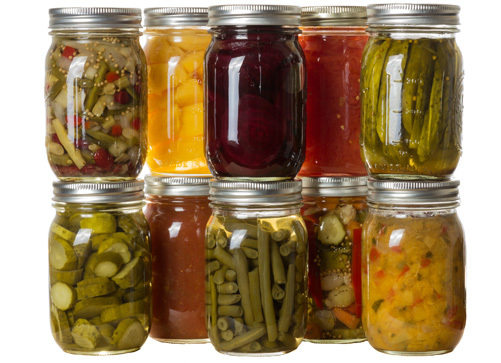 Quantity: An average of 22 pounds is needed per canner load of 7 quarts; an average of 14 fresh pounds is needed per canner load of 9 pints. A bushel weighs 53 pounds and yields 17 to 20 quarts of crushed tomatoes-an average of 2¾ pounds per quart. 2. Wash tomatoes and dip in boiling water for 30 to 60 seconds or until skins split. Then dip in cold water slip off skins, and remove cores. Trim off any bruised or discolored portions and quarter. 3. Heat one-sixth of the quarters quickly in a large pot, crushing them with a wooden mallet or spoon as they are added to the pot. This will exude juice. Continue heating the tomatoes, stirring to prevent burning. 4. Once the tomatoes are boiling, gradually add remaining quartered tomatoes, stirring constantly. These remaining tomatoes do not need to be crushed. They will soften with heating and stirring. Continue until all tomatoes are added. 5. Boil gently 5 minutes. 7. Add 1 teaspoon of salt per quart to the jars, if desired. Fill jars immediately with hot tomatoes, leaving ½-inch headspace. Remove air bubbles and adjust headspace if needed. Wipe rims of jars with a dampened clean paper towel; apply two-piece metal canning lids. 8. Wipe rims with a clean damp cloth, adjust lids and process in either a boiling water canner or pressure canner according to the recommendations.